A recent addition to the gem world, Helenite is actually a man-made crystal. Resulting from the volcanic eruption of Mount Helen on May 18, 1980, the formation of this obsidionite was noted in the lava. 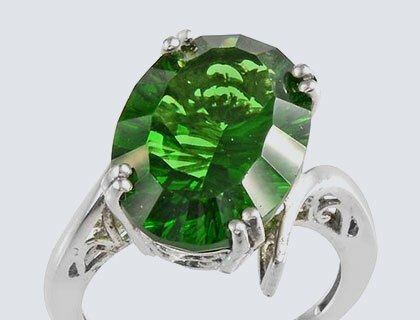 The artificially synthesized stone flaunts a riveting and enrapturing green colour, which holds a lustre so arresting that it makes people stop and appreciate the jewellery. The origin of the stone dates back to the recent years. On May 18, 1980, there was recorded a behemoth volcanic eruption at Mount Helena, United States of America. The losses and the destruction recorded upon this eruption were insurmountable, so much so that it blew about three hundred feet of earth right off the mountain and smoked an area of 60,000 feet in the air. It also left a crater behind, which measures up to a mile. However, when excursions begun after the tragedy, some people noticed that the rock mass, upon heating, was producing a glittering, rich green stone behind. That occurrence garnered a lot of attention. It was later understood that the volcanic rocks with the heavy presence of silica, aluminium, and iron along with the traces of chromium and copper were melting to product this unique stone, which is now available in green, red, and blue. Later people started chiselling the stone and selling it to be embellished in brooches, rings, earrings, and more. It is where it was named “Helenite.” In the following times, a US-based company Dharma started commercially distributing the stone, therefore making it popular. And thus, a tragedy and some volcanic ash produced one of the greatest gemstones we display at TJC. The lustrous colour and appealing clarity of the stone speaks much more than words can. The stone is found in a vast variety of colours. However, only a selection of hues is popular. And those include Swiss blue and rich green. The final hue of the stone is determined with the addition of relevant colours upon the heating treatment of the volcanic ash. In its final form, Helenite is one luring stone. With an unparalleled clarity, the final outcome has no visible inclusions in the stone, facilitating a clean see-though appeal. It is also considered to be highly vitreous, owing to its mesmerizing glitter upon being faceted. Another thing to note about the composition of the stone is that it only rates 5 to 5.5 on the Mohs scale of hardness. It means that the gemstone is easy to break and needs special care. You should make sure that you don’t expose the stone to any outdoor situation where it might come in contact with a blunt force trauma, eventually causing it to break. It is also important to keep it away from harsh chemicals and ultrasonic cleaners. Many healers also believe that this stone is the ideal gift to present to your love partner. It is said that it heals the bond between romantic partners and family, facilitating emotional growth and evolution. Some people also say that it distributes harmony wherever it is placed, making it easier for people to live together. When it comes to the physical healing powers, astrologers claim that it is a highly effective stone. Like most of the crystals, it is believed that Helenite can also ward off the negative energy in the room where it is placed or from the person who wears it. As it has been already established, Helenite is a relatively softer stones as compared to other crystals. Therefore it needs care and protection from any sort of external damage and abrasions that might tarnish its glittering surface. It ranks only 5.5 on the scale of hardness, which means that it is susceptible to damage and cracks. If you need to clean the stone, you may feel free to wash it under a steady stream of lukewarm water. If there is persistent grime and dirt settled on the surface, you can add a few drops of mild detergent or scrub with a soft-bristled toothbrush. Wipe it with only soft towels and cloths. A produce of a tragedy, Helenite is the product of a massive volcanic eruption of the Mount Helena, in 1980. The discovery of the stone was accidental when a few salvagers noticed that the heating volcanic rocks produced green-coloured stones. Helenite is synthetically produced with a special heating technique. It is also available in a wide range of colours from red to blue and orange.